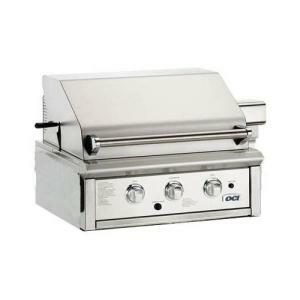 The OCI Elite 30 Propane Grill offers a spacious 774-square-inch cooking grid and a built-in rotissierie, with one of the heaviest stainless steel grill hoods of any model on the market. This built-in grill is heavy duty, and some interesting features are available, but cooking options are not as full spectrum as you'd expect in this price range. A motorized rotisserie unit with its own infrared burner rated at 15K BTUs has a weight capacity of 50 pounds, enough for two turkeys on the spit at once. This is a much better option than trying to cook with indirect heat on this two burner grill. Each of the main burners is rated at 28K BTUs, and all three are independently adjustable. Standard on this grill is an "easy slide" grease-catching pan that runs in and out of the catch area on ball bearings -- that's a very pleasing touch, considering how unpleasant it can be to struggle with a pan full of grease and waste oil. While not especially fancy, this grill was made to please, with heavy duty controls that are polished stainless steel and an insulated grill hood. The friendliest addition to the design is a halogen lighting system under the hood, so you can continue to cook after sundown without bringing in spotlights. As with most grills, the high quality stainless steel cabinet will still require a grill cover for protection from weather -- the stainless steel won't rust, but there are openings which could let in rain and cause other problems.